On a global level, the wastewater minimization market is highly affected by a few key drivers: pollution prevention, water recycling, water reuse, and zero liquid discharge. These drivers have been brought about by global water shortages, increasing population, and more stringent environmental regulations. All of these factors increase the cost of clean water and lead to the reduction of and the need for more efficient use of water supplies. To a great extent, wastewater minimization efforts in the United States are being driven by similar factors. Commercial users here and around the world are evaluating process improvements that will enable them to conserve water and, in turn, decrease wastewater volumes. Furthermore, the limited capacity of publicly owned treatment works (POTWs) and the economic benefits of reusing water are increasing the demand for complete water recycling systems across industrial, agricultural and residential segments. The deployment of water recycling systems has helped offset increases to water costs, proving to be a worthy investment for end users by providing long-term savings. Existing water reuse and conservation regulations are being broadened to include new norms and are being strictly enforced. These regulations include limits on the types and concentration of chemicals that may be present in the discharged wastewater. Moreover, the guidelines issued by the U.S. Environmental Protection Agency (EPA) for water reuse and discharge limits on wastewater are forcing end users, particularly industrial facilities, to consider deployment of water recycling systems. The U.S. Environmental Protection Agency (EPA) regulates the discharge and treatment of wastewater under the Clean Water Act. The National Pollutant Discharge Elimination System (NPDES) issues permits to all wastewater dischargers and treatment facilities. These permits establish specific discharge limits, monitoring and reporting requirements, and may also require industrial, municipal and other facilities to undertake special measures to protect the environment from harmful pollutants. Effluent guidelines are national standards for wastewater discharges to surface waters and publicly owned treatment works (POTWs), which are municipal sewage treatment plants. EPA issues effluent guidelines for categories of existing sources and new sources under Title III of the Clean Water Act. The standards are technology-based (i.e. they are based on the performance of treatment and control technologies); they are not based on risk or impacts upon receiving waters. In the past few years, new factors are promoting the greater use of wastewater minimization treatment methods. Water Shortages: Over the years, clean/fresh water supplies available for municipal, commercial and industrial users have declined on a global level due to use of an already limited supply and drought conditions. As a result, it has become important to incorporate treatment technologies that minimize the overall production of wastewater while simultaneously producing reuse water that can then be injected back into the treatment process. Process Improvements: In general, most wastewater minimization treatment processes (e.g., reverse osmosis, ion exchange, ultrafiltration) typically associated with high operating and capital costs have been reengineered to offer process improvements while reducing costs and making them more attractive treatments options. Environmental Responsibility: Whether through regulatory or self-imposed measures to positively impact the environment, global "green" trends are prompting industrial producers of wastewater to seek treatment methods that limit their direct and negative impact on the environment. Reuse: Zero liquid discharge (ZLD) is gaining popularity as a wastewater treatment method since it eliminates the discharge of water by recycling it into the process while the waste that is extracted from wastewater during the ZLD treatment is then the only disposal element of the process. Coal is the most abundant energy source in the world, and it also is a major source of hydrocarbons, particularly gas. Large amounts of methane-rich gas are generated and stored in coal beds, but only recently has coal been recognized as representing an enormous undeveloped "unconventional" energy resource. In recent years, commercial production of coal bed methane has been undertaken in the United States, and this development is expanding to other countries. Production of coal bed methane is accompanied by significant environmental challenges. Coal bed methane (CBM) production requires the pumping of water to extract the gas. This produced water, separated from the gas in the borehole, contains high levels of sodium (Na) and carbonates (CO3). More stringent federal and state water regulations now prohibit the discharge of this water into the environment or its use for irrigation due to its high salt content. Chemical treatment of CBM-produced waters can be economically prohibitive, so industry has long searched for safe, affordable treatment alternatives to meet regulatory standards. Since 2003, the Higgins Loop(TM) Continuous Ion Exchange Technology has been shown to offer a proven, economical, and efficient process for the purification of produced water without the generation of hazardous wastes or large byproduct streams. Ion exchange is a unit process in which ions of a given species are displaced from an insoluble exchange material by ions of a different species in solution. The patented Higgins Loop process incorporates a continuous countercurrent ion exchange contactor for liquid phase separations of ionic components using solid exchange (I-X) resins. The ion exchange technology's contactor is a vertical cylindrical loop, containing a packed bed of I-X resin that is separated into four operating zones by butterfly, or "loop" valves. These operating zones -- adsorption, regeneration, backwashing and pulsing -- function like four separate vessels. Produced water containing high sodium (Na) levels is fed to the adsorption zone within the Higgins Loop where it contacts strong acid cation resin which loads Na ions in exchange for hydrogen (H) ions. Treated water exits the loop containing less than 10 milligrams per liter (mg/L) Na. The carbonate contained in the water, also harmful to the environment, is removed via carbon dioxide (CO2) evolution from the low pH treated water. Concurrent with adsorption and in the lower section of the ion exchange technology, Na-loaded resin is regenerated with either hydrochloric or sulfuric acid to produce a small, concentrated spent brine stream. Regenerated resin is rinsed with water prior to reentering the adsorption zone to remove acid from its pores. 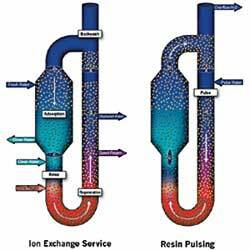 As resin in the upper layer of the adsorption zone becomes loaded with Na, the flows to the ion exchange technology are momentarily interrupted to allow advancement of the resin bed (pulsing) through the loop in the opposite direction of liquid flow. Liquid flows are restarted after resin pulsing is complete. Treated water is slightly acidic due to its increased H ion strength, and it is neutralized with limestone, which also increases its calcium concentration so that the water's sodium adsorption ratio (SAR) is less than 1.0. Spent brine containing removed Na ions has a density high enough for use as a kill fluid. The ion exchange technology makes water laden with Na and CO3 safe for reintroduction to the environment. The byproduct water, which once was an environmental problem, now is being reused by ranchers for irrigation, watering cattle, and as a source for drinking water for humans. And no wastewater is generated in the process. The Higgins Loop technology has proven to be a more effective ion exchange technology than fixed bed and fluid bed systems. It efficiently uses the resin capacity, uses less regenerant and fresh water, generates consistent product quality, and minimizes wastewater volumes. The technology offers greatly expanded ranges for the use of ion exchange resins and adsorbents in commercial separations.